02. Tenma Leaps Through Time! 05. Dismay! Soccer is Banned!! 06. Fierce! Protocol Omega 2.0!! 07. Training at God Eden! 08. Master It! Keshin Armed!! 09. Get The Holy Book of Champions! 10. A Shocking Reunion! Endou Daisuke!! 11. Find Them! The Strongest Eleven In History!? 12. We`re Here! Nobunaga`s Village!! 13. Huge Battle! Team White Deer!! 14. Infiltration! The Great Dancer Mission!! 15. Training in the Owari Province! 16. Final Battle at the Fool`s Festival! 20. Soccer in the Flames! 22. Liu Bei is funny! 24. Fierce Attack! Zanark Domain!! 27. Swordsman of the Late Edo Era! Okita Souji!! 28. Soccer Battle! Sakamoto VS Okita!! 30. 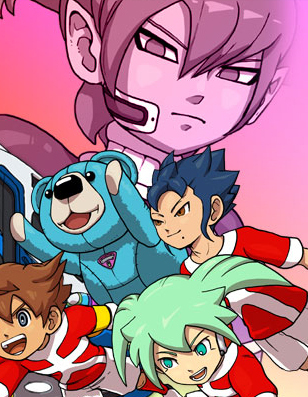 Legend of Endou Mamoru! 31. To The Dinosaur Era We GO! 32. Watch this! King of the Dinosaurs!! 33. Big Showdown at Beast Valley! 35. The Jump Into Legend! 36. Assemble! Knights of the Round Table!! 38. The Fearsome Hyper Dive Mode! 39. Union! Raimon and El Dorado!! 40. Sublime Opening! The Final Match, Ragnarok!! 42. The Eleventh Strongest Power In History!